Flying Colours Corp. completed its third 120-month, heavy maintenance check on a Bombardier Global airframe. 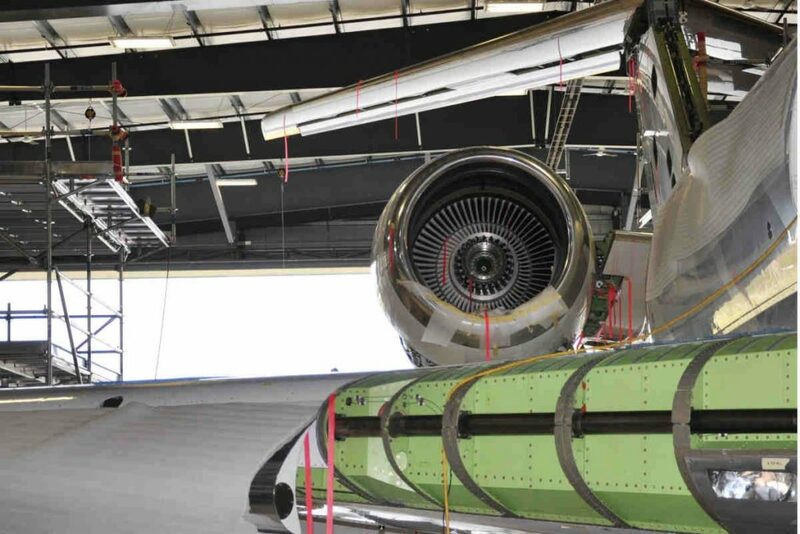 The 10-year inspection of the Global Express required the privately owned aircraft to be stripped back to the airframe to enable a full structural inspection. The interior was also stripped bare, explains Flying Colours, which removed wall panels, carpets, insulating surfaces, floorboards, monuments, external fairings and panels to perform maintenance assessments and the requisite overhauls. The aircraft was redelivered at the end of July and represents the last in a trio of 8C checks completed in the last 12 months. The project, which was undertaken at Flying Colours’ facility in Peterborough, Ont., also included a full landing gear overhaul, replacement of the cabin seats with new seats, new exterior paint and interior soft-goods refurbishment and cabinetry refinishing. Heavy checks are also being completed on Bombardier Challengers, Learjet and Dassault Falcon types at the company’s facilities in Peterborough and St. Louis (KSUS Flying Colours). “Both facilities regularly conduct light to heavy maintenance across a range of airframes. We also handle interior modifications and technical upgrades in parallel which maximizes the aircraft downtime helping the owners save time and money,” Gillespie said. With facilities in Canada, United States and Singapore, Flying Colours’ range of services include: Green completions, interior refurbishment and modifications, heavy maintenance, exterior paint, special mission modifications and avionics installations. The company specializes in all mid- to large-sized business aircraft, including the Bombardier Global Express and Challenger families, Dassault Falcon, Beechcraft/Hawker and Gulfstream models.